Using the first three letters of his name and his wife’s middle name, Donald Albery formed Donmar Productions in 1953. In 1961 he bought a warehouse that had been previously been used as a vat room, a film studio, and a banana-ripening depot. This private rehearsal space was acquired by the RSC in 1977 and converted into a theatre, opening 18 July of the same year. The theatre remained a space for RSC productions and workshops until its acquisition by Roger Wingate in 1990. 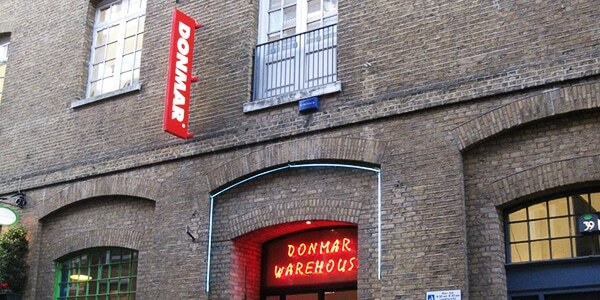 After a refurbishment, the Donmar Warehouse reopened under Artistic Director Sam Mendes. A series of classic revivals including Assassins, Cabaret, The Glass menagerie, Company, Uncle Vanya, and Twelfth Night made the Warehouse one of the most popular theatre venues in London. In 2002, Michael Grandage (who had directed several productions during Mendes’ tenure) became Artistic Director. The theatre saw many radical changes, including regularly commissioned translations of foreign plays, popular musical productions, a 1 year season in Wyndham’s Theatre in the West End starring a range of celebrities including Kenneth Branagh, Jude Law, and Dame Judy Dench, and successful transfers to Broadway (Red, Piaf, and Creditors). Grandage left the Donmar in 2012, with Josie Rourke succeeding him as Artistic Director. The Donmar continues to hold exciting revivals and new translations of foreign plays within its 250-seat space.